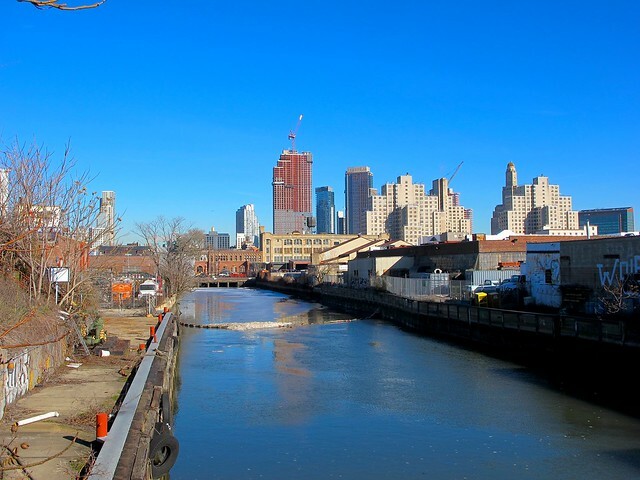 The first 2016 meeting of the US Environmental Protection Agency's Gowanus Canal Superfund Community Advisory Group will take place on January 19th at 6:30 pm at P.S. 58, 330 Smith Street. Perhaps this is a perfect time to review what has been happening with the Gowanus Superfund in the past few months and to focus on what is likely to be the major discussion related to the environmental clean-up of our waterway in this coming year: the siting of an 8 million gallon Combined Sewer Overflow retention tank at the head of the canal. 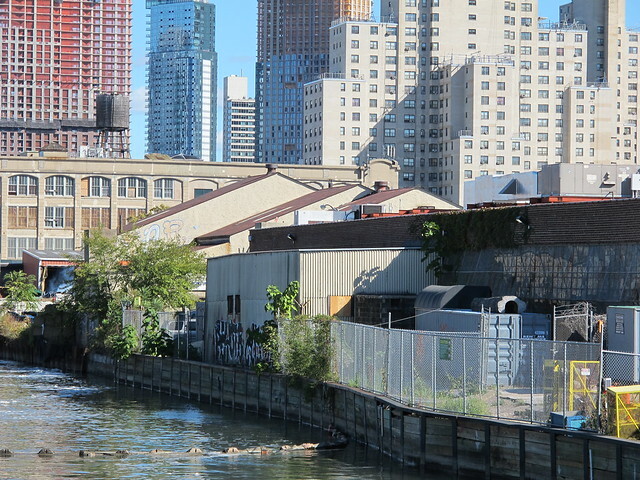 The Federal Agency and New York City has hinted that it will soon announce its decision regarding the siting of the larger of two Combined Sewer Overflow (CSO) retention tanks that EPA has ordered New York City Department Of Environmental Protection (DEP) to construct in Gowanus. The tanks are needed to capture raw sewage currently being discharged into the canal and to protect the environmental remedy outlined in the Record of Decision in 2013. 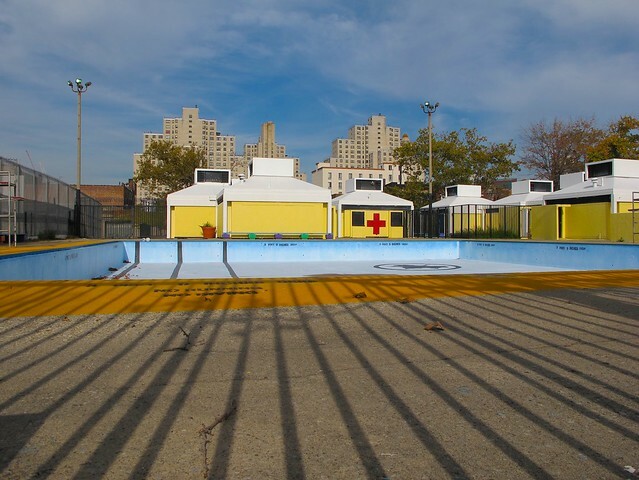 In the Record of Decision, EPA's Region 2, responsible for overseeing the Gowanus Superfund clean-up, has suggested placing the 8-million gallon tank underneath the Double D pool at Thomas Greene Park. The Agency reasoned that the site is already owned by the City, which would save the cost of acquiring land. 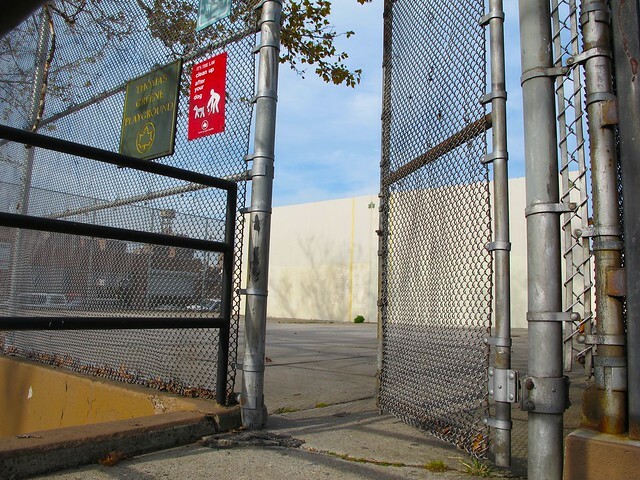 In addition, the park sits on top of the former Brooklyn Union Gas Fulton Municipal Manufactured Gas Plant (MGP) which was in operation at this location from 1879 to the early 1930s. Since coal tar is currently oozing under the pool area and flows towards the Gowanus Canal, National Grid, the party responsible for the environmental clean-up, has been asked by EPA to dig up the pool so that the source contamination can be removed. By working in tandem with National Grid, DEP would save money and time. The NYC DEP, on the other hand, would prefer to site the 8-million gallon tank on privately-owned land along the canal, adjacent to the park. The sites in question are 234 Butler Street and 242 Nevins Street. In addition, the City wants to acquire 270 Nevins Street, which is currently occupied by Eastern Effects Studios, as a staging area. The City is willing to make use of Eminent Domain to acquire the three properties if the private owners are unwilling to sell. The necessary legal proceedings involved in making this happen will take time and millions of dollars. The City wants to place the tank and a 50 feet high head house for the mechanical elements needed for the tank at 234 Butler and 242 Nevins partly because of the proximity to the rest of its Gowanus infrastructure at the head of the canal, and partly to "protect Thomas Greene Park" since the nearby community is underserved when it comes to open space and recreational facilities. The problem with the City's eminent domain plan is that it will delay the environmental clean up of the Gowanus Canal by about 3 to 5 years, which EPA is very concerned about. In late 2015, things got even more complicated. Alloy, a real estate development firm based in Dumbo, has proposed an alternative solution that may reduce or eliminate the clean-up delay as well as offset the loss of parkland. Alloy is proposing to build an as-of-right commercial development with a 2.0 Floor Area Ratio (FAR) that will provide much needed creative office space in Gowanus. Distributing the allowable square footage into two four-story buildings instead of one large two-story structure would allow Alloy and the owners of the sites to donate a sizable piece of land to the City. According to Jared Della Valle, Alloy's president, the donation would create additional permanent park land that would exceed the land lost to the head house in the park, if it were placed there. It would also preserve the properties' tax base and create jobs in the area. Alloy came in front of the EPA Gowanus Canal Superfund Community Advisory Group to discuss their plan in early December. "We believe that our proposal could save the unnecessary time of pursuing eminent domain" Jared Della Valle, Alloy's president, told the Community Advisory Group. "It would also save the City up to a hundred million dollars." What do Alloy and the owners get out of it? "No eminent domain. It's that simple," Della Valle explained. After the December 2 , 2015 meeting, I reached out to Christos Tsiamis, EPA Region 2 Senior Project Manager for the Gowanus Superfund. I asked him if the EPA would have a conflict with the plan Alloy presented to the CAG and if it would support EPA's proposed technology related to the siting of the tank. "EPA is aware of Alloy’s proposal to New York City (NYC). Alloy met with EPA to explain the proposal and they also submitted to us the presentation they made to the CAG earlier this month. 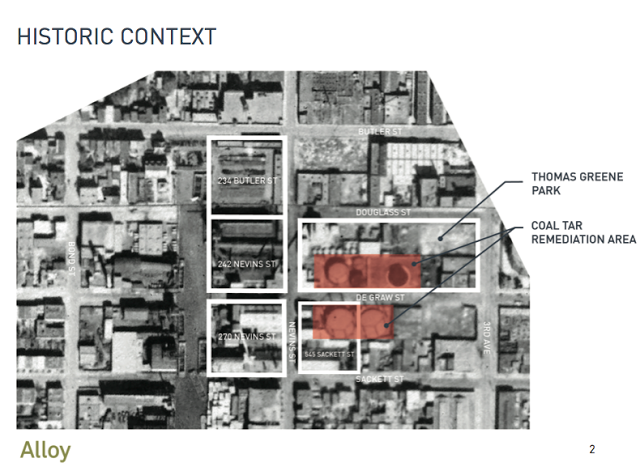 It is evident that under their proposal NYC is expected not to condemn the two northern-most parcels on the east side of the Gowanus Canal for the purpose of building the retention tank there. In return NYC would receive from Alloy, as a permanent donation, a portion of those two parcels (over 50,000 square feet) to be eventually developed as parkland. To answer your question, Alloy’s proposal is not in conflict with EPA’s plans. On the contrary, it is in accord with EPA’s Record of Decision (ROD). The ROD assumed that the retention tank would be placed in NYC-owned land thus reducing the cost of the project (by eliminating land acquisition costs for NYC) and creating cost and schedule synergies out of the simultaneous cleanup of the tar source at the Thomas Greene Park and the construction of the underground retention tank. EPA believes that the Alloy proposal creates new possibilities for moving on with the design of the retention tank. It addresses EPA’s concern for disruptions in the Canal cleanup schedule by avoiding the lengthy delays associated with the taking of land through eminent domain. It also addresses the community’s need for maintaining the present park and even gaining additional parkland through the donation of private land. Finally, it offers significant cost savings to the City as the ROD had envisioned." The EPA will be updating the community at the next Gowanus Canal Superfund Community Advisory Group meeting on January 19th. The meetings are open to the public. I urge everyone to attend. 2016 should be an interesting year for Gowanus. I can't wait to see the City's fabricated and exaggerated reasons to reject this smart proposal. The use of text and images strictly forbidden without the author's consent.